Hummingbirds are attracted to a good nectar recipe, but so are ants, bees, hornets, wasps, and other sweet-loving insects. Fortunately, there are many easy ways to control insects to keep bees away from hummingbird feeders without harming the birds. Several types of insects find hummingbird nectar irresistible. Bees, wasps, and ants are the most common uninvited guests, but other insects such as moths, hornets, spiders, praying mantises, and earwigs may also be attracted to the nectar. When too many bugs are feeding on the sugar water, it becomes contaminated and less attractive to hummingbirds. In extreme cases, dozens or hundreds of insects may monopolize a feeder, preventing birds from visiting at all. By knowing safe ways to control these insects, birders can manage their hummingbird feeders and reserve the nectar for the birds. There are many ways to keep bees away from nectar feeders, but the first thing birders need to realize is that it is impossible to remove 100 percent of the insects attracted to a feeder. By using multiple methods, however, it is possible to encourage most bugs to dine elsewhere without harming the hummingbirds. Choose No-Insect Feeders: Some types of hummingbird feeders are less insect-friendly than others. Saucer feeders, for example, position nectar away from the feeding port and insects are unable to get to it, while hummingbirds with their long tongues have no trouble. Other feeder designs include built-in ant moats or bee guards designed to keep insects from accessing the nectar without stopping hummingbirds. If feeders don't have these safeguards built in to the design, extra accessories are available to add those features to any nectar feeder. Relocate the Feeder: Once hummingbirds find a food source, they will visit it frequently, and will look around nearby for even more good food sources. Insects are only likely to visit convenient food sources and are less inclined to search for relocated feeders. Moving the feeder just a few feet can minimize insect visitors without discouraging hummingbirds. This is easy to accomplish in a yard with multiple feeding stations when birders simply switch where different feeders are positioned throughout the yard every time the feeders are refilled. 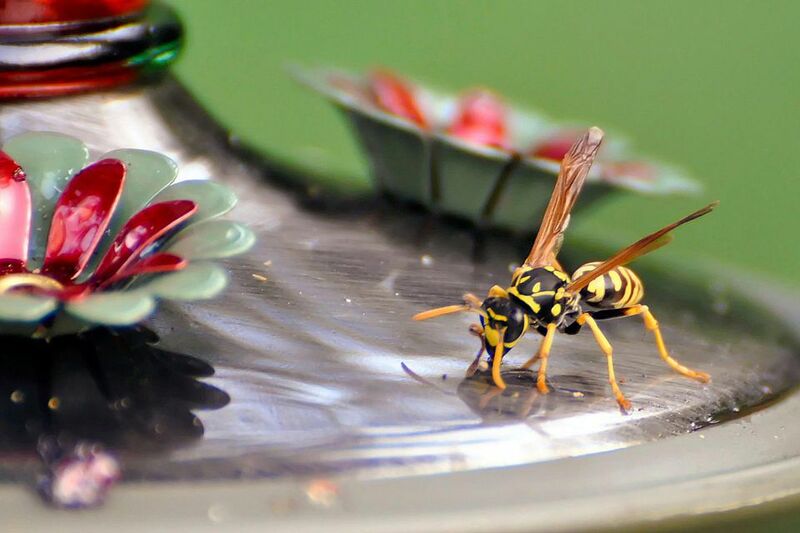 Avoid Yellow Feeders: Wasps and bees are attracted to the color yellow but do not find red as appealing. Avoid feeders with yellow insect guards or flower accents to minimize the feeders’ attractiveness to insects. If your feeder comes with yellow accents, repaint the accents with red, non-toxic paint. On some feeders, these yellow parts can easily be removed without impacting how well the feeder works. Keep the Feeder Clean: As birds feed, drips of nectar will inevitably fall from their bills onto the feeder. Feeders can also drip if they are filled too full, as the air pressure inside the feeder will force the nectar out the feeding ports when it heats up. Each time the feeder is refilled, carefully clean the outside and around the feeding ports to remove spilled nectar, and take steps to minimize leaks to avoid the mess that can attract insects. Use Insect Traps: Commercial insect traps are available to reduce overall insect populations in the yard. While these can be effective deterrents, use them sparingly so you do not disrupt the insects’ place in your yard's ecosystem. Only choose traps that target the most problematic insects, and remove traps as soon as the feeder is no longer being troubled. Hang Feeders Carefully: Ants may climb a pole to reach a nectar feeder, so hang the feeder from a branch or gutter instead. Using fishing line to hang the feeder is another option, as the line is too thin for most ants to climb to access the feeder. Keep the Feeder Shaded: Most flying insects prefer to feed in full sunlight, so make nectar feeders less attractive by hanging them in a shadier spot. This will also keep the nectar cooler and slow fermentation as well as minimize leaks. Offer Substitute Feeders: If you hope to keep bees away from hummingbird feeders but still want them around for your flowers or garden, offer them a substitute feeder with a sweeter sugar water solution. Place the diversion feeder, preferably a yellow one, in an obvious, sunny location, while using additional techniques to protect the hummingbird feeder. Avoid Other Attractions: Bees, wasps, and ants are naturally attracted to other features of your yard, including plants and flowers. This is highly desirable for a healthy garden, but avoid uncovered trash, sticky soda cans, piles of manure, and other things the insects may find attractive. This will minimize their unintended food sources and keep insect populations under control. It may take several different techniques to completely minimize insect visits to hummingbird feeders. There are two techniques, however, that should not be used because they are potentially destructive to hummingbirds. Insecticides: Even a small amount of pesticide chemicals near the hummingbird feeder can be devastating to these tiny birds. Do not use any sprays near the feeder, and if you do choose to use insect traps, be sure they are positioned well away from the feeder. Oils: One home remedy for insects on hummingbird feeders is to use olive oil, cooking spray, petroleum jelly, or similar slippery substances around feeding ports or on the poles supporting feeders. While this can deter insects, it can also harm the birds by sticking to their feathers and making it more difficult, or even impossible, for them to preen and fly. Not all insects are bad in a hummingbird garden, even if they do occasionally visit nectar feeders. Bees help pollinate flowers that can attract even more birds, and all these insects can be valuable food sources for other birds. Simple, safe techniques can manage insects so they do not bother hummingbird feeders yet remain a valuable part of a natural ecosystem.